A fire pit provides the perfect entertainment area for outdoor living. It adds to the look of the landscape and can be used to stay warm in the cold winter months when you still feel like sitting in the open and enjoying the nip in the air. The simplest way to make a fire pit is to dig a hole in the yard and line it with a non-inflammable porous material like sand. But for those who prefer well-planned outdoor spaces, we can customize a Fire Pit exactly how you would like it. We can also help with installation informaion and contractors who have the expertise to install fire pits based on your specific requirement and budget. The pit is made by digging a hole in the gravel or soil. The rim of the pit is then lined with concrete blocks. Many fire pits are lined with bricks or different kinds of stones. This is a low wall that prevents the logs from rolling out as you sit around the fire. This can be a temporary installation and the bricks/stones can be set without any mortar. If required, a permanent grill can be built into the fire pit. 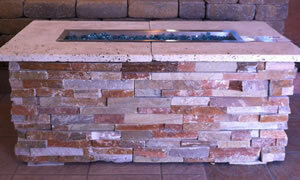 The fire pit can then be surrounded by low stone benches or outdoor furniture. You might want to enclose part of this outdoor area. This will mean that you can enjoy the warmth of an outdoor fire and still be sheltered from bad weather. The fire pit may be fed by a gas line or a propane gas tank can be fitted to it. Wood burning pits can be constructed in areas where they are legally permitted. Some locations do not have a good wood supply and outdoor fire pits are the perfect solution for these areas. All Masonry specializes in custom fire pits made specically for your needs, or you can shop our showrooms to find something you like. A gas fire pit is often a smart choice. Unlike traditional wood fire pits, gas does not require any cleanup and these are an excellent option for those who are looking for low maintenance fire pits. We have the experience and the expertise to design and build any kind of fire pit for you. Creative designs that complement the ambience of the landscape, patio, garden or yard and add beauty and elegance to your home. The portable barbecue pits are essentially large bowls that may be made of ceramic or metal and they have short legs. Most will have a wire mesh cover which prevents the embers and logs from falling out. The rim of the bowl may also have a grate. But many homeowners like permanent BBQ pits and we can build them in various styles and materials. We have the experience and the expertise to design and build all kinds of fire pits for you. Creative designs that complement the ambience of the landscape or patio, garden or yard add beauty and elegance to your home. 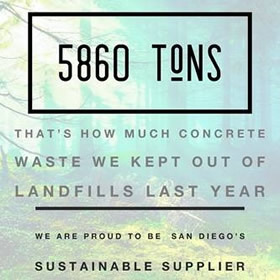 Contact All Masonry and Landscape Supply for the best fire pits on 760-941-7263, 845 West Vista Way, Vista CA, 92083.